Nothing completes a backyard escape like a refreshing in-ground pool. Wouldn’t it be nice to relax in the comfort of your own backyard instead of the town pool next summer? Some homeowners go years before finally deciding to invest in a pool, but we’re here to tell you that there’s no time like the present. 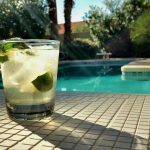 Read on to discover why 2019 is the best time to invest in a pool. The sooner you invest in a pool, the longer you’ll be able to enjoy it, guaranteeing you get the most bang for your buck. Lounging by the pool and taking a nice dip makes the summer months the best time of the year. On 90-degree sweltering days, there’s nothing better than taking a splash in the pool. Sit back, relax, and install your pool in 2019 to ensure a relaxing summer year after year. Are you someone who likes to entertain? Elevate your social gatherings and transition your parties from the living room to the backyard with an in-ground pool. A well-executed pool party can be the highlight of your summer. From elegant pool party galas to volleyball infused affairs, a pool is the perfect conversation starter. Slice watermelon and pour cocktails because the party is just getting started. Be the host that makes them boast in 2019 by installing your pool now! Dive into fun with the entire family. The town pool is nice, however it’s often crowded and its sanitation is questionable. Install a pool and keep your family cool, fit, and entertained as the temperature heats up in 2019. Swimming and pool games make some of the greatest family pastimes, so stock up on inflatable floats, tubes, and volleyballs for hours of fun. While a pool is a great way to promote bonding, it’s also a fantastic way for the whole family to become healthier and active. There’s no time like the present. If you’re debating on whether to act now or delay your pool installation, we suggest building now. Doing so enables you and your family to start enjoying your backyard pool sooner and longer. From entertaining to exercising, it all can be done in the without constant trips to the gym this year. Take it from us, 2019 is the best year to invest in a pool!